The Question: How do you get a group of lawyers to smile for a photo? Yes, yes, lawyers do have a sense of humor about lawyer jokes. Really, we do. Now, let’s get to the point. Fees. Years ago, I worked as an in-house counsel which meant that I was the client. The company I worked for hired lawyers to handle its human resources and employee issues, its intellectual property portfolio, its regulatory compliance standards, etc. So, I used to review bills. Stacks of bills. And, I used to have to figure out how to keep the attorney’s fees in the budgets that were allowed in my department. 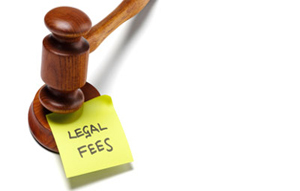 So, I was always looking for ways to bring fees down and incorporate alternate fee arrangements with firms and attorneys that I really enjoyed working with. Now, back to the future. When I started my own firm, I knew what in-house counsel, startups, clients, and even solo inventors wanted. They wanted budgets, predictability, and efficient billing. Enter: Alternative fee arrangements. Why alternative? The typical way an attorney works is to bill you by the hour. They have an hourly rate and they multiply that by tenth of an hour increments to figure out what you need to pay them. This model is standard and espoused by most firms in one way or another. The way you save money in this model is you find attorneys with lower billable rates (who may take more time to do things) or higher billable rates (who are faster at doing things). At the end, they probably cost about the same. And at a large firm, a high billable rate attorney then reviews the low billable rate attorney and charges you for that review. So, firm shopping is important. I have a theory on firms since I have worked at large ones and small ones. Firms are like jeans. Some are really expensive, some are more affordable, but at the end they all CYA. The attorneys at affordable firms usually leave very large (eh hem, often overpriced) firms because they did not like how they were doing business or so they could actually see their families. These are still excellent, fantastic attorneys who went to great schools and passed the State Bar. They do not want to be disbarred and so they will do extremely competent, high quality work for you. The reason I tell you this is because the smaller the firm, the less bureaucracy there is, and the more likely you can negotiate an alternate fee arrangement. Start with your choice of firm. Then, when you are consulting with a firm to see if you want to engage their services simply ask if they have any opportunities for alternative fee arrangements. There are many examples of arrangements that are not the “billable hour” model on which you can rely on for your budget. Read on to learn about these examples in, Types Of Alternative Fee Arrangements For Legal Billing, coming August 13, 2012. Intellectual Property expert Tina Loza has successfully defended and protected Fortune 500 companies, small businesses, and start ups. Tina Loza is an IP attorney and the Managing Partner of Loza & Loza, LLP, a specialized legal practice with offices throughout Southern California, that supports clients worldwide with patent, trademark, copyright, and Internet law needs. For a free consultation or more information contact Loza & Loza, LLP.